Quite a lot of aquarists beginners face the problem of how to control snails population in a tank (melania snail, ramshorn snail and snails from Physidae family), when their number becomes too big. So, two questions rise simultaneously: how to get rid of these snails and where did they come from? Well, if you haven’t put them into the tank on purpose, they could have got into it together with the bought tank plants whose leaves might have had snails eggs on them. As it’s known many kinds of snails are hermaphrodite species and provided with good feed just one snail may create a thousand species. At that you won’t see snails juveniles, since usually they hide when they are small and then, after they grow up, they start appearing in all their number. 3.7 Snails in the tank: is it good or bad? Usually, snails get into a new tank as eggs or as adult species brought together with tank plants, decorations or when removing fishes. So, check all the plants for snail eggs or put the plants in the solution of Hydra-Tox, that kills snails eggs. But even the most attentive aquarists have snails in their tanks. Snails are of no hazard to a balanced tank. Instead of fighting them, it’s better to control their population number, since their rapid breeding signalizes that there are some troubles in a tank. The main reason that causes the appearance of surplus number of snails in a tank is overfeed of tank fishes. The snails feed on fishes meals leftovers and their number grows exponentially. If they have become a problem in a tank, first check if the fishes aren’t overfed. Usually the leftovers accumulate in the tank substrate and become feed storage for snails, therefore the second task is to siphonate the substrate and remove them. Also snails feed on algae and if you don’t have Ancistrus or other alike catfishes in your tank, it’s worth to put them into it to create nutritive competing conditions. Besides, catfishes feed on snail’s eggs. It is more often used by beginners due to its seeming simplicity. Chemicals that kill snails should be harmless to other tank inhabitants, but experienced aquarists will tell you that this approach can be used only if you don’t care if other tank inhabitants will survive. Especially if in a tank you have shrimps which are very sensitive to such chemical substances, since usually they contain copper that is poisonous to all spineless species. Try not to overdose the chemical substance, since it can be lethal to all your tank. For example, you can use Seachem Cupramine Copper. This is the most tiring and exhausting approach. But the majority of aquarists still use it. Usually, it’s done when cleaning the tank and the snails are removed, too. Though, this isn’t the way to get rid of snails completely, but it helps to control their population. Snails love vegetables such as lettuce, cucumber or cabbage. Pieces of these vegetables can be used as a bait. In the evening put some vegetables on the plate on the tank bottom, in the morning you’ll see a number of snails there and you can remove them from the tank. The only drawback of such an approach is that the water gets a bit muddy (it becomes chalky), but it’s ok, it’ll pass in 2-3 days. As well as manual removing of snails out of the tank this approach is unlikely to help you to free the tank from snails completely, but this way you’ll be able to control their population. Traps for snails are manufactured by many companies nowadays, you can always order them over the Internet. They are different in their construction, but they act all in the same way – a snail smells the feed, gets inside the trap and can’t get out. This is the good way to decrease the number of snails, but it requires time and constant efforts. There are several types of tank fishes that feed on snails. The best one is green spotted puffer (Tetraodon nigroviridis), since snails are the main feed for them just like for all species of this family. This fish can chack even a hard shell of Melanie snail, as for ramshorn snail and snails from Physidae family – they will be completely destroyed. Tetraodon nigroviridis is the most efficient fish to fight snails, but this is a rather badly behaved fish – it can attack other tank inhabitants and feed on prawns. Except this fish also a freshwater clown loach eats snails. The fish is large and easily eats ramshorn snails, but it won’t crack the hard shell of MTS snail. The drawbacks of keeping such a fish in a tank is that it’s a large one and they should be kept in a school which isn’t always possible. Also paradise fish (Macropodus), gourami and other anabantids feed on snails, though they eat snails only if hungry. Therefore such fishes aren’t very efficient if the task is to get rid of snails completely. Crustaceans also can give you a hand when dealing with snails population number in a tank. For example, Macrobrachium – it is a prawn about 6-7 cm long or more. It’s completely peaceful, but if you don’t feed it and it’s hungry and angry, it’s rather capable to eliminate all the snails. 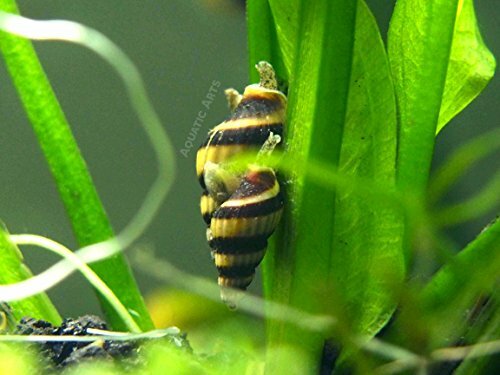 Predator assassin snail (Antentome helena) are sarcophagus species and they eat other kinds of snails. Recently they’ve become very popular and they are easy to buy. These are good looking snails with cone-shaped shell. They grow to be 1-2 cm big. Helena snails can decrease number of tank snails significantly and even to get rid of them at all. If this happens, they start feeding like all other snails, however such a diet isn’t common for them. Removes all pest snails including pond snails, bladder snails, ramshorn snails, Malaysian trumpet snails (MTS), and more. Will not attack anything but snails - safe to keep with shrimp, fish, live plants, etc. These snails burrow themselves in the substrate to clean up waste. Aquarists who keep assassin snails in a tank are the ones who solve the problem of other snails population number once and for all and at that they always have ..snails in their tanks. Snails in the tank: is it good or bad? It is for you to decide if snails will be your tank inhabitants or not. They can both do harm and do good for a tank. So what is the role of snails in a tank balance? Snails are natural cleaners: they clean the bottom substrate from feed leftovers, dead fishes, fish excrements, rotten parts of tank plants, remove biological slime on water surface, fur on tank walls. These shellfishes play an important role in maintaining of tank biological equilibrium, and some snails behavior (for example, Melanie snails) indicates the purity of tank bottom substrate and water, which helps the aquarist to notice and solve the contamination problem timely. Snails are beautiful in their own way and they can be a decoration element in the tank. When there isn’t enough of other food in a tank, snails can eat and damage tank plants. There may appear a problem of snails overpopulation (and lack of oxygen correspondingly), since the majority of snails breed rather intensively. You can’t bring snails from outdoor waters to your tank, because together with them you may bring infection into it. It’s desirable for the tank to be covered with a lid, since some snails (especially apple snail) may run away from the tank. Don’t overfeed the fishes, since their food leftovers are the reason why snails breed so rapidly.